While i’m totally holding out for that intense mini pro-sumer RED Scarlet, and for now i’m shooting video with my tiny Canon TX1… i am quite intrigued by the little Flip Video cameras, with overly simplified usability i’ve been told… the perfect gateway video camera for the not so computer savvy is what i heard most all through the holiday season… simply flip out the USB, stick it in your computer, and that was that - ready for youtube-ing. I was skeptical. 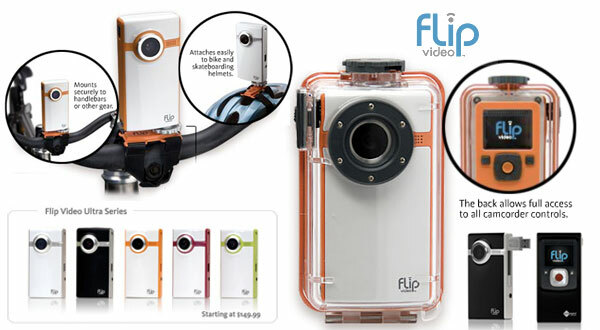 But today the Flip Video cameras came up again, and i was browsing the accessories, and i must admit i’m terribly intrigued - they have an Underwater Housing coming soon! And they already have an Action Mount! The Action Mount is basically a standard tripod screw in mount with velcro straps that you can attach to bikes, helmets, trees, cars, anything you can strap it on to! Can you imagine how crazy random reviews and spontaneous videos could be with something this tiny when accessorized for any type of weather/mounting? I know this isn’t the only option to accomplish these things, but it did get me thinking about everything from car-videos to underwater product reviews… and for a mere $140 for a 2GB Flip Video Ultra, it’s a pretty tempting idiot-proofed toy. For part of an action/sports video project I purchased and used 10 of these “underwater housings” ALL of them failed in less than 3 feet of water due to a design flaw regarding the button controls. Flip really showed no interest in replacing them or recognizing the flaw, so I have 10 of these now as a wall decoration. For an extra investment GoPro makes a far superior product in every way, don’t waste your time on anything else. I recently bought an orange Flip Video Ultra and LOVE IT. This thing is so much fun and is so ridiculously easy to use. I’ve been online for about 28-years and am pretty tech savvy, but bought this specifically because it is very quick and easy to use. The Ultra model has higher video quality and starts up quicker than the original (which is still sold). 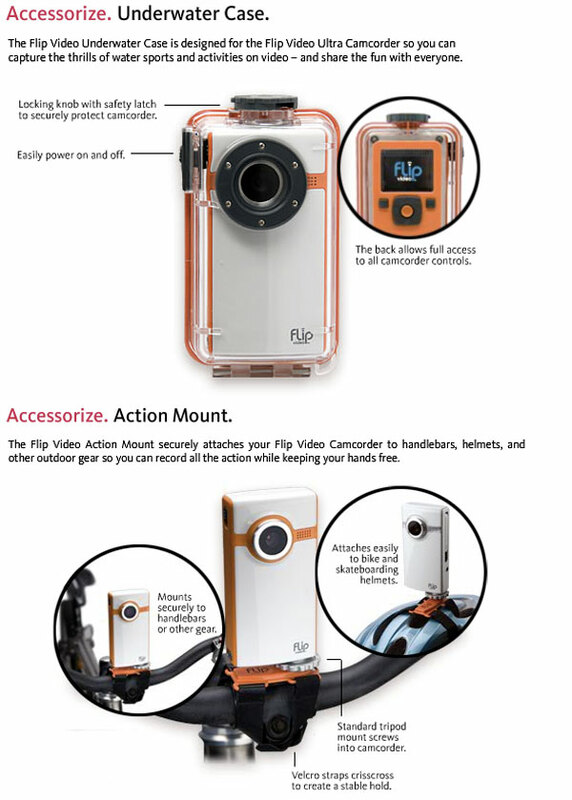 Also, the action mount, tripod and underwater case only are useable with the Ultra model. Regarding batteries, 2 standard akaline double A’s have so far provided about 2 hours of use including recording two dozen clips ranging in length from 30-seconds up to 6-minutes as well as reviewing the clips, etc. I’m still on my first set of batteries and am VERY happy with its performance. I’ve read in numerous places that the Ultra gets much better re battery consumption. And finally, i’ve seen videos on YouTube with the underwater case being used, and have read lots of reviews, and for $40 the thing just simply cannot be beat! It works up to 30-ft underwater and is completely waterproof (as it better be!) when used properly. I run Mac OS X Leopard and the whole thing was plug & play, literally. EXTREMELY EASY to use and is fun to use for even little kids all the way through senior citizens. I bought the camera for $130 and the tripod for $14.95, both on Amazon. Am going to buy the action mount, too, after seeing neat movies people made using it. It’s also only $14.95. All in all, this camera delivers exactly as promised and is a very nice quality unit. It’s got lots of the same design cues that are familiar to anyone who has bought an iPod or other Apple products — the packaging is even really, really nice and fun to open. The tripod comes with 5 different color rubber feet so you can mix, match or put on the ones to match your camera’s color. Silly? Yes. But fun and no extra cost for the freedom to make those ‘silly’ (aka fun!) choices. I’ve been trying to decide if I should get one or wait for better reviews of an HD mini camera. But the damn little thing is calling me. I saw it at Walmart yesterday and was ready to reach for my wallet. I’m worried about sound quality. Funny this came up. I’ve been trying to resist buying one for a couple weeks, and today decided to concede. There are sample videos on youtube and the quality seems good enough. For that price? Perfect. At my previous job, our CEO bought these for everyone at the annual meeting… They’re pretty nifty little things, but not something I would have purchased on my own. While they are ridiculously simple, my only complaint is the battery life… The two double a’s go quick, so make a point to remove them when not in use! I LOVE THE FLIP! It’s super easy to use and shoots great video. I have access to a wide array of professional and prosumer gear and nothing has gotten me as excited as this little camera. It’s perfect for what it is, an easy to handle camera to shoot clips for the net. The affordable price is also a great factor, even the accessories are reasonably priced. My underwater casing has been ordered and should arrive any day. If you’re on Flick and have a Flip please consider joining our Flickr group.